However you look at it, the fact remains that Rowett has to sign a ‘keeper. With only inexperienced Nick Townsend on the roster, it’s become a priority. Whether that man will be Legzdins, Wes Foderingham, David Forde, Ben Amos, Brad Jones or any of the other 33 goalkeepers linked to the club recently, only Rowett knows. I suspect that Rowett would have considered giving Doyle another year if he anticipated losing Randolph to West Ham. Some say that he had already accepted he was going to lose him and had already decided on Doyle’s future. Whatever the situation, Blues must report back to pre-season training with a number one in tow. While Townsend has a big future, his inexperience could be telling in the Championship. It is thought that Rowett may select him for odd cup fixtures to hone his ability and to bed him in. But in a gruelling 46 game season, can a raw youngster handle the pressure and expectation? 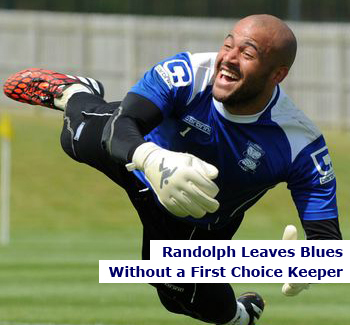 I was a big fan of Randolph so it isn’t sour grapes when I say that Blues have lost better goalkeepers and survived. Maik Taylor, Joe Hart, Ben Foster, Boaz Myhill and Jack Butland have all departed in recent seasons and have been adequately replaced – so why should it be any different this time?